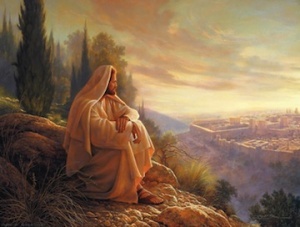 Greg K. Olsen is a prolific and diverse artist, but is most famous for his depictions of Jesus Christ. He is a member of The Church of Jesus Christ of Latter-day Saints. Members of the Church gravitated to his work that appeared in the Ensign magazine and Deseret Book, catapulting him and his work into widespread demand. He has since published calendars, tabletop books, and other products in addition to his originals and prints. During his teen years at Bonneville High School, he studied under art teacher Bob Whitney, who “contributed more to Greg’s art education and desire to make it his life’s work than any other person.” He then studied art at Utah State University. After college, he was hired as an in-house illustrator in Salt Lake City, where he worked on a variety of projects, from murals and dioramas to simple paste-up. Two years later, he followed a friend's advice and began painting full-time. Sales from his first show only just covered the cost of refreshments and invitations, but yielded the first of many commissions that were to come. Olsen and his wife, Sydnie, are the parents of six children. This page was last edited on 29 May 2015, at 14:52.